Economist, Investment Advisor, and Author. ​Dr. Robert Genetski is the founder and President of ClassicalPrinciples.com, a global economic and financial consulting service. His experience in the world of economics and finance involves a unique combination of business and academic expertise. He has headed asset management, investment research departments and served as the chief economist for several financial institutions. He has also taught economics at NYU and the University of Chicago's Graduate School of Business. After receiving his Ph.D in economics from New York University (NYU), Genetski worked in the banking industry and subsequently founded of his own economic and financial consulting service. He has served on the board of directors for several public companies and provides insights and personal commentary on his website classicalprinciples.com, in addition to authoring five books. 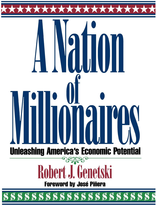 Genetski is the author of a number of books, notably A Nation of Millionaires, Taking the Voodoo out of Economics, and Winning with Money. His recent book, Classical Economic Principles & the Wealth of Nations, has received rave reviews for its clear, concise explanation of the economic policies necessary to promote wealth and prosperity. It has recently been translated into Chinese. His upcoming book, Rich Nation, Poor Nation, provides an extensive global analysis of the economic policies that lead to prosperity and poverty. Dr. Genetski has been a longtime advocate of classical economic principles. Not unlike Adam Smith in The Wealth of Nations, he has used his knowledge of these principles to create economic forecasts, from correctly predicting stagnation in 1977, an economic revival in the 1980s and 1990s, to historically low interest rates in 2001. In early 2008, he warned of a financial collapse, six months before it occurred. The bottom line in all of these predictions is that the negative predictions correlate with a shift away from the implementation of the classical economic principles and vice versa. Ultimately, Dr. Robert Genetski's illustrious credentials make him the ideal fit to author Classical Economic Principles & the Wealth of Nations in an attempt to reiterate the economic formula that has catapulted the United States to the top for so many years. Dr. G uses humor and anecdotes to explain how classical economic principles can help us anticipate where the economy and financial markets are heading. As one of most knowledgeable economists in the United States, Dr. G would love to attend your event to present the ideas of the free market to your group. He has spoken to over 200,000 people and has had featured articles published in The Wall Street Journal, Investors Business Daily, and has made appearances on Fox News and CNN. U.S Economic and Financial Outlook, Global Outlook, Taking the VooDoo Out of Economics, Creating a Nation of Millionaires, Analyzing and Forecasting Financial Markets, Seminars on Forecasting Techniques. How the Global Economy Will Impact Your Business. Dr. Genetski is a widely-recognized expert on developments throughout the world. His latest book, Rich Nation Poor Nation, has received rave reviews as “an instant classic that should be on the desk of everyone with an interest in human prosperity.” His global presentation provides fascinating insights to developments in countries throughout the world and how they will impact your business. Rich Nation Poor Nation: Why Some Nations Prosper While Others Fail . Dr. Genetski explains how the most important issue in economics is why some nations are wealthy while others are poor. He explains how in spite of a massive amount of new data there has been no popular systematic analysis of the implications of this data. His book provides such an analysis. Genetski claims that those armed with the evidence he presents will be able to determine the future economic prospects for almost every nation. How Economic & Political Developments in the United States Will Affect Your Business. Drawing from his extensive research into the economic and political history, Dr. Genetski analyzes current trends from a historical perspective. His analysis shows how past cycles provide unique insights into where economic and political forces are heading and how these changes will impact your business. The Federal Reserve’s Role in the Financial Crisis & Its Implication for Stock Prices and Interest Rates. Dr. Genetski is one of the nation’s leading experts on monetary policy. His unique perspective on the Fed’s role in the financial crisis has important implications for the future direction of stock prices and interest rates. His shocking analysis and insights on Fed’ policy will appeal to anyone with an interest in financial markets. We Can Eliminate Poverty. In this passionate and captivating presentation, Dr. Genetski draws on the evidence in his book, Rich Nation Poor Nation. He provides powerful evidence on the causes of poverty and how some of the poorest nations have successfully overcome their poverty. His uplifting conclusion is we have the power to eliminate abject poverty from the face of the earth. Unique Presentations. Dr. Genetski welcomes the opportunity to provide presentations suited for particular groups, industries or companies. In each case he works closely with the client to make sure his presentations focus on the most relevant topics for each group. He is qualified to speak on technology, manufacturing, housing, financial markets, retail, trade and most other areas impacted by economics.